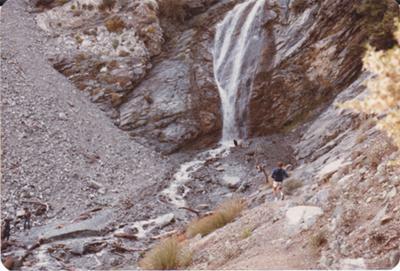 We would climb up the falls along the crevice to the left of the falls all the way up then over to the chute to the left of the falls and run down the gravel chute. It was so steep it was like running on the moon. One step, then sink into the gravel, then another, and so on, but your strides would be like 5-10 yards long. I certainly would not do it now since it was pretty dangerous!! The chute of gravel was so steep you could not even crawl up because the gravel would just keep flowing down bringing you with it. Oh those wild crazy younger days! There was also a natural rock slide down stream off the side of the road on the drive up to the falls. You would sit down in the stream then push off sliding into the stream. Then plunge off a 20 foot free fall into a deep pond. Afterwards, we’d go up a knotted rope on a small cliff then hike a short distance back up the road returning to the stream to do it again and again.